...Yesterday’s Senate vote on the proposed flag burning amendment was 66-34, which was one vote short of the needed 67 votes (two-thirds of the Senate) that would have sent the bill to the states for ratification. ...Being a big fan of free speech, I’m quite happy knowing that this form of speech is still protected. Even though many of us think that the Supreme Court ended the debate in the 1989 case Texas v. Johnson, in which the justices held that convictions for flag desecration are inconsistent with the First Amendment, the argument will no doubt continue. This most recent bill is evidence of that. ...With that said, I’m also one of the first people to suggest that those who resort to burning a flag to show their disgust with the government usually do so because they don’t have the intellectual capacity to form a cohesive, informed, and intelligent debate via words—be they oral or in the written word. The flag is, after all, a symbol; if your protesting abilities can’t extend beyond fire, why should those of us who can form cohesive thoughts take you seriously? ...The limited intellectual faculties of flag burners aren’t necessarily my primary concerns for this post, however, as we’ve come to see that this most recent round of First Amendment debate has helped to illustrate our society’s contradictory ideas of what “free speech” might be. ...Before I continue, it should be noted that I’m not going to suggest that yelling, “Fire!” in a crowded theater should be protected; dozens of people might end up injured—if not killed—in such a case. ...What I am suggesting is that we have a few matters that show how some segments of the populace view certain things as “speech,” while other segments don’t agree whatsoever. It’s essentially more evidence that Americans—as a whole—are willing to view similar things in a different light so long as their own interests are at stake. 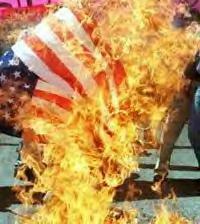 Many of those who are in favor of banning flag burning are the first to say that campaign-finance reform is a bad idea, since money is “speech.” Many who support the McCain-Feingold legislation are the first to call flag burning “speech.” Perhaps I’m wacky, because I see both fire and money as speech. Many of those who support banning Confederate flags from sight—no matter if they’re flown, on T-shirts, bumper stickers, notebooks, etc.—are opposed to banning the burning of the American flag, since the argument is twofold: (1) It’s free speech, and (2) a flag is just a symbol. I’m of the firm belief that (1) it’s free speech if you choose to burn your American flag or fly your Confederate flag, and (2) a flag is, indeed, a symbol. Similarly, differing ideologies view the burnings of American flags and rainbow flags (viewed by some as a hate crime) differently. Correct me if I’m wrong, but burning either flag is done so out of hatred for what that particular flag symbolizes. Therefore, we should either say that both are hate crimes or both are free speech. True, I’m an open critic of how the laws regarding “hate crimes” have been applied (only recently, a white NYU student was chased by a group of black assailants who, according to witnesses, were yelling, “Get the white boy!”; the NYU student ran into traffic, was struck by a car, died in the hospital, but police said that the incident wasn’t a hate crime), but that becomes a separate debate altogether. ...It should be known that while I’m willing to support a person’s right to burn a flag—any flag—it should be noted that I’m completely and unequivocally opposed to the acts of trespassing, theft, and vandalism that have often accompanied the burnings. Even in Texas v. Johnson, Gregory Johnson burned a stolen American flag—he didn’t even have the balls to buy his own. Likewise, in many of the reported cases of rainbow flag burnings, we see a recurring pattern: The flags don’t belong to those doing the burning. ...Idealistically I would love to see a world where we all got along and no one would have a reason to burn any flags. That’s not reality, however, and so we need to attempt to view things a bit more pragmatically and maturely. Does that mean that we can’t have a few ideals? Absolutely not, because a few ideals give us goals for which we can strive. ...In this case, the ideal would be that we, as a whole country, come to realize that we’re taking similar instances and calling them different things simply because it fits our agenda. No matter the issue at hand—be it burning flags, campaign contributions, or hate crimes—we’re seeing the same thing but viewing it differently. Since you’ve mentioned butter, now I’m wondering if the militant vegan community has their own flag, too. Shouldn't anyone labeled "militant" have their own flag? Really, I've read it at least 3 times now and it's just been now that I've come up with something insightful to say (because really, you seemed to cover it all). One thing did come to mind regarding Campaign Finance and the whole 'money as speech' thing. While not explicitly so, the almighty American dollar is quite a symbol in our culture; it's an icon of our democracy, capitalism, and our egos. Would someone stand out on a street and burn money? I dare say not. But of course, currency is not our official symbol, but it's a large part of who we as a nation are, and what people see in their minds when they think of us (as well as a hapless world police force with electric cattle prods, angry dogs, and strangely shaped black hoods). Maybe it strays from the point some, but it's what came to mind. Again, excellent post. The issue of campaign contributions is actually something that has always bothered me, even though if I were forced to decide, I’d say that money equals speech. I think it’s because I don’t want to be naïve enough to pretend that major corporate donors aren’t influencing (read: buying) votes, and that’s the point that’s always bugged me. On one hand I want to be able to argue that if I choose to donate—which I’ve never done—to a certain candidate that it’s a way of voicing my opinion that his/her views are also my views. In essence, I’d want it to be seen as if that candidate’s votes were reflective of my beliefs. At the same time I’d be the first to say that politicians are basically available to the highest bidder. If Company X donates several million dollars, there’s a good chance that Company X is going to get the votes that they want. That’s not to mention that it doesn’t stop at direct campaign donations; it goes so far as which company employs the local constituents. If Company X employs a large number of local voters (local or state level), the local/state politicians are more than likely going to help those corporations—large or small—when it comes to voting on bills that would affect the business. The latter situation occurred in a town near where I live when it was discovered that the area’s largest employer was dumping toxic automotive chemicals—and in some cases entire automobiles—on their land, endangering that town’s water supply. At first there was talk of the Environmental Protection Agency and Department of Environmental Protection looking into the matter, but within a few weeks the matter disappeared off the radar and hasn’t been discussed since. That was three years ago.